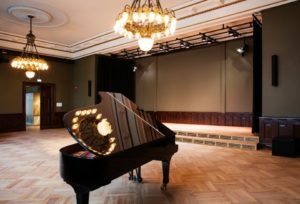 We have a real gem for you – Norway’s oldest savings bank refurbished into a bustling house of culture; Sentralen has become a unique meeting place for culture, art, drinks and great food – in the middle of Oslo city centre. portraits of all the directors in the bank’s history. Come join us for a great Balboa floor, antique chandeliers and our very own Golden Bar, in the grand Director’s Hall!